After Motorola released the well-received Moto X into the world last year, most of us had just one question: What's Google's expensive mobile division doing next? Then-chief Dennis Woodside was surprisingly forthcoming for a tech CEO -- he said Motorola wanted to reinvent the experience of using a low-cost smartphone. When the Moto G appeared later that year, I thought the company had done what it set out to do. Oh, how wrong I was. Motorola still hasn't given up on its dream of putting smartphones within reach of anyone who wants one, and the latest weapon in the company's arsenal is its cheapest yet. The Moto E costs a scant $129 here in the States, and Motorola seems confident that its low-cost formula will do some real good for the people of the world (not to mention the company's bottom line). Now we're left with another set of questions: Does the Moto E live up to Motorola's lofty goals? Can it stand out against a clamoring crowd of competitors? Are you actually getting what you pay for? Read on for our take. 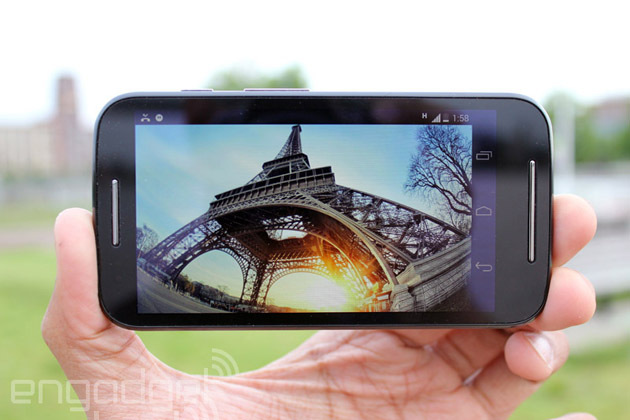 How would you rate the Moto E? 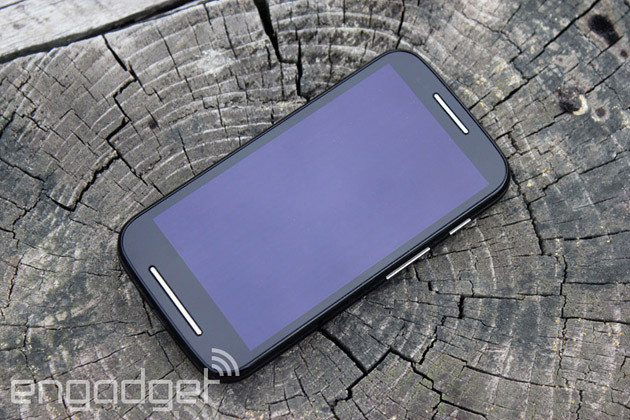 The Moto E is one of those curious devices that's unassuming and yet immediately recognizable at the same time. That sounds a tad paradoxical, but hear me out. Its face is spartan, to put it politely, and the E's 4.3-inch qHD screen (swathed in Corning's Gorilla Glass 3 no less) is bounded by some unobtrusive bezels. Your eyes can't help but be drawn to the two silver strips that run in parallel above and below the screen, comprising the speakers and microphone. Together, they make for a very tasteful touch of personality that gives the E a sense of self without much extra visual noise. 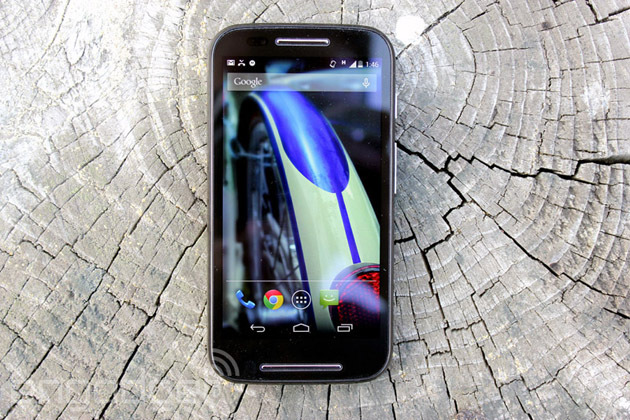 Flipping the Moto E over reveals that the company's design DNA hasn't been diluted at all. The recessed Motorola logo, the swooping curve around the 3.5mm headphone jack -- if Superman took hold of a Moto G and compressed it a bit (you know, without turning it into a diamond or something), you'd basically have the Moto E. Meanwhile, a 5-megapixel camera sans flash sits high on the E's rear and selfie fanatics will be crushed when they discover there's no ego-stroking front camera here. The E skews toward the chubbier end of the size spectrum (compared to the lithe Moto X, at least), but its curved rear means it'll fit quite comfortably in your mitts. During my testing, I actually found myself cursing at my otherwise trusty iPhone 5s and its prominent edges. The E is awfully nice to hold, even when compared to premium gadgets like HTC's One M8. Our review unit pairs a glossy, black plastic face with a curvaceous, matte rear. Those of you itching for something more chromatically pure can pick up the white-on-white model, and you can replace those default backs with more colorful ones for another $15 a pop. Prying off those back plates reveals... not much, aside from the non-removable 1,980mAh battery, the SIM slot and the microSD card slot. That expansion slot is downright crucial, too, since this little guy comes with a paltry 4GB of internal storage -- easily the surest signifier of the Moto E's wallet-friendly ambitions. Once you factor in all of the preloaded bits, you're actually left with just north of 2GB of open space for your apps and media; suffice to say, a hefty memory card (the E can handle up to an additional 32GB) should be on your shopping list too. Diving further still reveals the E's brains: a dual-core Snapdragon 200 clocked at 1.2GHz, paired with 1GB of RAM and a single-core Adreno 302 GPU. The North American version I've been playing with is slightly boring compared to some international variations. Models for other markets include a digital TV tuner or dual SIM slots. The vanilla US model is pretty sparse in terms of niceties, though it does (like the Moto G) have a built-in FM tuner for when you need some music that didn't come from the Google Play Store. There's no LTE to be found here, alas -- just a GSM radio that plays nice with the 850/900/1800/1900MHz bands, and UMTS/HSPA+ support for 850/1700 (AWS)/1900MHz frequencies. Really, though: For $130 off-contract, what did you expect? It's less than half the price of the Nexus 5 and the Moto X, but as you'll see, cheap doesn't always equate with crappy. For a phone of such humble means, the 4.3-inch IPS LCD sitting front and center still manages to impress... even if it's the lowest-resolution display I've laid eyes on in a long time. In a bid to keep costs as low as possible, Motorola ran with a qHD (960 x 540) screen -- if you're doing the math, that works out to a pixel density of 256 ppi. The number by itself isn't very exciting, but I think we can agree that the quality of a screen hinges on more than just how many pixels a manufacturer can squeeze in there. Sure, you can pick out individual pixels if you peek closely enough. Taking a step back offers up a different, more positive perspective, though. The display itself is plenty bright, with crisp whites and passable blacks (we're not in AMOLED territory, after all), though I wish it fared better under the blazing sun. Colors are vivid and manage to pop without dipping into lurid, oversaturated territory. Viewing angles are similarly solid -- just be warned: Images can take on a peculiar cast when you peer in from an angle that's oblique enough. You'll also have a tough time trying to obscure that screen with your greasy fingers thanks to the anti-smudge coating Motorola has liberally applied. Is this screen perfect? 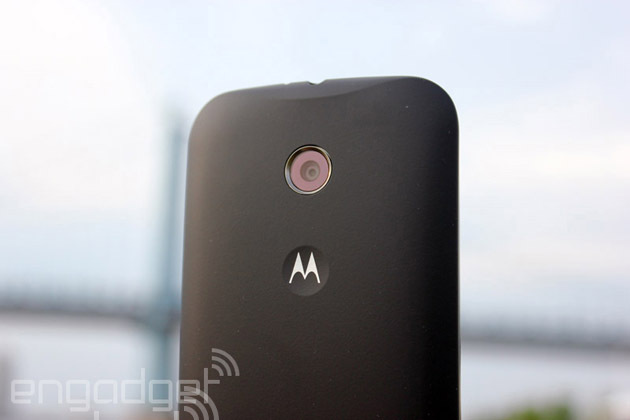 Hardly, but its strong showing helps make the entire Moto E package that much more enticing. Like its brethren before it, the Moto E runs a nearly stock build of Android 4.4.2 KitKat, which means there isn't anything terribly exciting to report on the software front. That's just fine by me -- I hate clunky, overwrought interfaces and "features for the sake of features" as much as the next elitist nerd. What you're ultimately left with is a clean-ish slate that stays true to Google's mobile vision, but still retains a few of Motorola's curious software fingerprints. Take Motorola Migrate, for instance. It first appeared on the Droid Ultra, and it still lets phone switchers transfer their existing data (e.g., contacts, messages) to their new E's once the app has been installed on the original phone. Assist is still around too, though it lacks some of the smarts it packed when it first appeared on Moto's most recent Droids. As always, it can monitor your calendar to deflect callers at inopportune times, as well as let only VIPs reach you in your slumber, but there's no way for the E to detect when you're driving and auto-respond to folks texting you. As it happens, though, Motorola's newest preloaded app is also its most curious. The new Alert is of two minds: You can use it to blast your location so a curated list of friends will know where to meet you, and it packs an emergency mode that starts reaching out to those contacts (and emergency services) if you find yourself in trouble. 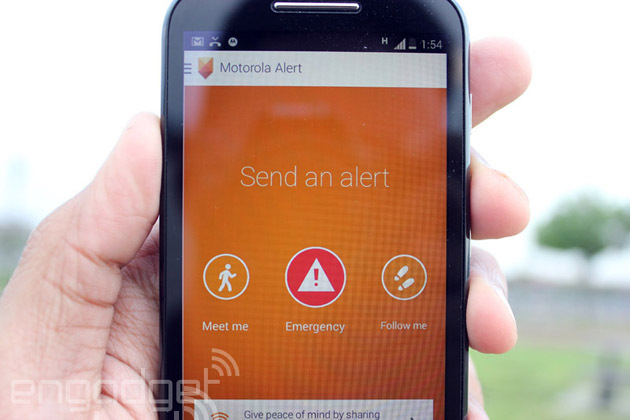 Alert is a surprisingly thoughtful addition to Motorola's software mix, but with any luck, you'll never need to touch that emergency feature. Motorola also promises that it'll get the next big version of Android in a timely fashion, even with a divorce from Google on the horizon. We'll see just how well Motorola can keep this promise soon enough -- for now, it's heartening to see a budget smartphone running the latest and greatest version of Google's mobile OS. Smartphone cameras are tricky enough to get right when you're trying to cobble together a top-tier device, so you've got to have the proper expectations when you go downmarket. In the case of the Moto E, I expected very little and I got it. That may sound a bit harsh, but the Moto G's camera was a pleasant surprise and I was quietly hoping for the same to happen here. Instead, the 5-megapixel rear shooter consistently turned in soft shots with colors that seemed muted at best and downright lifeless at worst. That last issue can be mitigated a touch if you fire up HDR mode -- it's set to auto by default, so you'll occasionally find a vibrantly colored photo mixed in with the rest of the mud. Low-light performance left plenty to be desired too: The E's camera isn't great at sucking up photons, so there's smudginess and grit all over the place, a situation that isn't helped by the lack of a rear flash. Oh, and in case you already forgot, there's no front-facing camera to be found at all here. If anything, Motorola's dead-simple shooting interface is the camera's saving grace. Quick refresher if you haven't used it before: Snapping a photo requires just a single touch anywhere on the screen, which means it's nearly impossible to screw up in the heat of the moment. Sliding my finger up and down the screen to digitally zoom in and out feels remarkably graceful too, even if digital zoom by nature makes for lousier shots. You may not absolutely love the shots you end up with, but I suspect you'll at least enjoy the process of taking them. My only major niggle is a strictly personal one: Despite using the E for over a week, I still had trouble remembering that touching the screen snaps a photo instead of focusing the camera where I wanted. That's a particular sort of muscle memory that's only really taken hold after a (shortish) career manhandling high-end phones, so the Moto E's target audience may not have the same trouble. Video leaves much to be desired too, which is hardly a shocker. The Moto E is incapable of shooting HD video -- resolution maxes out at 854 x 480, which is good enough for Instagram, but slightly less so when trying to capture important moments as they unfold. 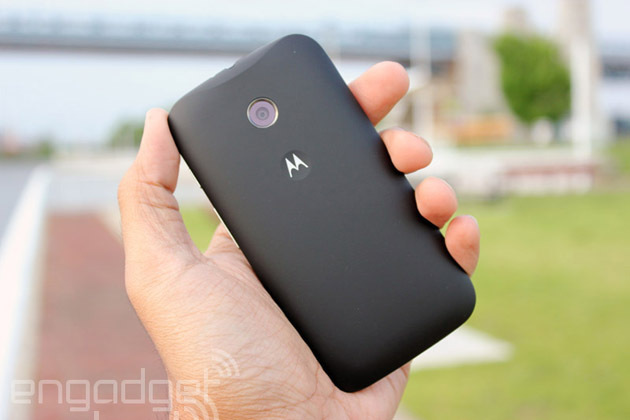 Ah, now we're getting to the meaty part -- what's the Moto E actually like to use? Despite a spec sheet that looks like it was pulled from the headlines two years ago, the E has more than managed to keep up with my daily grind. I can't in good conscience call the Moto E a speed demon, but it's still been a worthy companion during my week of testing. And what exactly did that week consist of? Plenty of frenzied swiping between pages of apps and widgets, to start. The whole process was consistently and pleasantly buttery, with nary a hint of stuttering or visual slowdown to be seen (though in fairness, KitKat probably deserves some of the credit for that). Scrolling down long websites was generally smooth, too... most of the time, anyway. An abundance of images on a web page (like Engadget!) occasionally threw the E's modest brains for a bit of a loop. The act of actually firing up apps usually took a few seconds more than on some premium handsets, but that's just par for the course considering what we're working with. The games I did manage to install on the Moto E (I'm looking at you, Minecraft: Pocket Edition) fared rather nicely considering the dearth of sheer processing power they had to work with. This is all anecdotal, of course -- here are some hard numbers, if that's more your speed. The funny (or sad) thing about downloading games for testing was that, well, it was more troublesome than it should've been. It had nothing to do with network connectivity (though I only hit down/up data speeds of 1.82 Mbps and 0.84 Mbps, respectively in San Francisco over AT&T's HSPA connection). Those headaches were all because of a dearth of storage space. Like I mentioned before, the E ships with just 4GB of internal storage, and only about half of that is available for your stuff right out of the gate. It didn't take long to almost completely fill up that modicum of space with just our usual suite of test apps and files. And those two-stage game downloads from the Google Play Store? The ones (like Need For Speed: Most Wanted, for instance) that prompt you to download an installer that then downloads more stuff once it's in place? Yeah, good luck with that. Picking up a microSD card is damn near a necessity, and even then, you can't move all of your apps from their current homes onto an external card. I get that it's a concession Motorola made to keep the E's price under a certain threshold, but I can definitely see some cost-conscious consumers ruing that decision. On the upside, the Moto E's modest spec sheet means that its 1,980mAh battery can hang in there longer than you might think. When Motorola says it's got an "all-day" battery, it actually means it. I spend my days dealing with a barrage of emails, chatting with colleagues, taking phone calls and generally running my device into the ground. There wasn't a time when the E failed to hang in there for a full 12-hour day, despite my best efforts. Things were a bit more subdued when it came time for our standard video rundown test (screen brightness set to 50 percent with a 720p video set to loop indefinitely): It stuck around for 5:45 before it needed to be lashed to a wall outlet. There's no shortage of cheap hardware out there, and more than a few competitors may wind up duking it out with Motorola over first-time smartphone shoppers. Take older, pint-sized versions of high-end phones like the HTC One mini and the Samsung Galaxy S4 Mini -- both of them offer more oomph, but even now they'll cost close to twice what the E does. Speaking of Samsung, you can nab a dual-SIM Galaxy S Duos 2 for close to the same price as the E-- you can juggle multiple phone numbers and enjoy a camera with a flash, though TouchWiz could bog things down a bit. There's the LG L40, too, a cheapo device the Korean company showed off at MWC. It hovers around the same price range as the Moto E, but its screen is markedly worse and a shortage of RAM doesn't exactly bode well for performance. The Nokia X will also give the Moto E a run for its money in certain locales. It's a curious little thing with its peculiar Finnish pedigree, offbeat launcher and €89 (about $141) price tag, but a weaker spec sheet and Nokia's control over its own app store means the experience it offers is limited in some key ways. Not all of the E's competition comes from outside Motorola, either. The Moto G packs more power and performance into a bigger body, and it's still only $50 more than its little brother. I'd wager that a decent number of shoppers on a budget will gravitate toward the more impressive G, but the difference in price could be too much for some to swallow. There's no two ways about it -- the Moto E is exciting, if not in the way most mobile buffs would like. You really shouldn't underestimate the sort of world-shaking power that can come from making something that's both very good and very cheap. So what if the spec sheet is a bit passé? For all its minor shortcomings, the Moto E still represents a level of power and quality that's become even more accessible to people the world over, and that's something worth celebrating. If all you need is a smartphone that can take you to Facebook, capture fodder for Instagram or fire off missives on Twitter (or WhatsApp or Weibo), the Moto E will make a worthy sidekick. Not every important device has to be a flashy flagship. If Motorola ever manages to offer the $129 Moto E for under $100 (and I bet it will eventually), we could be looking at a game changer; a device that could really help bring the next billion people into an age of connectedness most of us already take for granted. Until then, the E's value is obscured a touch -- the superior balance of performance and price means the Moto G will be worth the extra $50 for most people.